Bali Deli in Seminyak has various imported ingredients, especially from Europe and is popular among European residents. The cafe inside of the supermarket has gazebo and terrace seats, so you can take a break from shopping and enjoy a meal such as Asian or Western outside. I often go sightseeing in Seminyak but I didn’t know there is a supermarket at such a place. 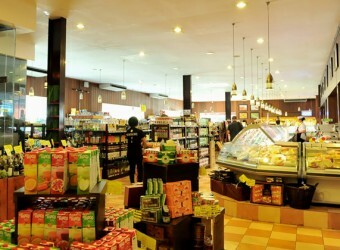 A large supermarket selling from daily necessities to imported goods! I bought wine. It was also fun just looking.